The other day I decided to run to work, instead of using my car. This sounded like a good idea after my vacation which involved excess food, alcohol and laziness that translated into few additional Kgs around the mid-section of my body. During my run, cars were stuck in traffic and this made me realise how this initiative was also a good contribution towards reducing carbon emissions. Being Safaricom’s Net Zero Carbon by 2030 champion, I should have thought about this first, but I won’t lie to you, it only came as a second thought. Fortunately there is a new road under construction between home and the office (cutting the 11Km road to only 6.5km) with minimal traffic as only pedestrians (and they are many in a city like Nairobi), the usual boda-bodas and some heavy machinery are allowed on the dirt road. As I was bragging about the run in the office, my friend Elly, who regularly walks across the entire city to come to work, encouraged me to take the same run back home. I quickly realised this was the best option I had, first because I wanted to be consistent with the objectives (both fitness and carbon emissions), second because I had no car to drive back anyway! 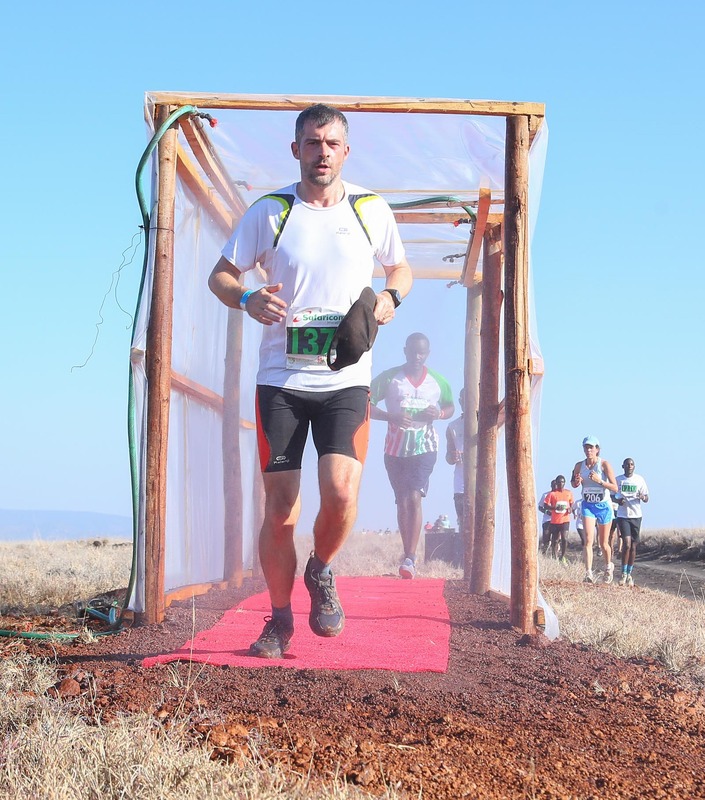 Thibaud running in the wild during the 2017 Safaricom Marathon in Lewa. My assistant Lydia, who is the warden of my agenda was very positive about this idea because I would then leave the office early in order to be home before dark (dark is at 6.30 in Nairobi) and certainly a good and safe idea have my feet off the road by then. This all sounded like a great plan and I was so proud of myself to be able to double up on my statement about burning calories instead of fuel. This was total shortsightedness from my side. If we are so committed to reduce carbon emissions, there is a reason (even if some pretend to ignore it) and it is to avoid aggravating the negative effects of climate change. How could I ignore this in my own plan ? Weather patterns in Kenya are characterised by long rains in April-May, and short rains in November (at least this is what we know from historical data). From Wednesday’s experience I know what a 23rd of August can look like in modern days Nairobi climate. At around 4pm, the clouds gathered in announcement of rain, and without fail from 4.30pm it started pouring. Being an optimist, I anticipated the rain would subside by around 5.30pm and I would proceed with my run. Well…. it rained way until past 6.30pm causing floods, power blackout and massive traffic snarls across the whole city. After a long wait, I decided to hit the road despite the rains. I had a very different experience on my way back home. The road under constructions initially only muddy and slippery was now a seasonal river. I was impressed by the lightning along the road, but what struck me most was the determination of hundreds of pedestrian that were on the same track as myself, although for a very different reason. I was running towards a hot shower and a set of dry clothes, they were enduring the harsh conditions without complain. I felt tremendous respect and admiration for them. I am now determined to run to and from work at least once a week, though a small contribution (estimated at reducing 3kgs of CO2 for the 22km of car drive I will save) but it can only help coming back to more predictable weather patterns !